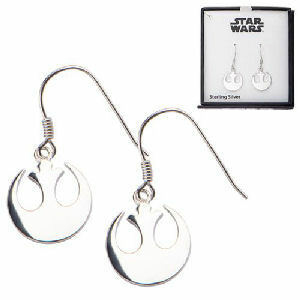 We have Just Sold out of Star Wars Rebel Alliance Symbol Cut Out Dangle Sterling Silver Earrings. Not to Worry! Fill in the Notify me When Available and you will be the first in line for our restock of Star Wars Rebel Alliance Symbol Cut Out Dangle Sterling Silver Earrings !! From the Star Wars collection by Body Vibe. Star Wars Rebel Alliance Symbol Cut Out Dangle Sterling Silver Earrings. The earrings are made of .925 sterling silver. Symbol measeures about a half an inch in diameter.